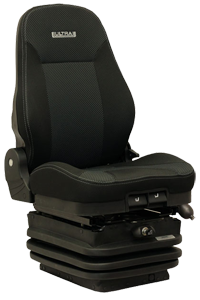 Our Universal Pod Seats fit into a large variety of applications with seat mounted joysticks. Ultra Seats cover a wide range of industrial applications suitable for most makes and models of equipment. Ultra Seat Corporation has distribution centers across North America and is expanding its dealer network around the globe. Don't forget to protect your seat with a seat cover kit! Available in high back, medium back, and low back styles for heavy equipment. Also available in a new semi-truck kit style. Now available Camo seat cover kits. Try our stylish Maple Forest Camouflage cover kits. Become an Ultra Seat Authorized Dealer to receive special product pricing. Ultra Seat attends many industrial exhibitions, trade shows and conferences. Find out where we've been, and where we're going. Don't forget to try a seat at our next upcoming event! 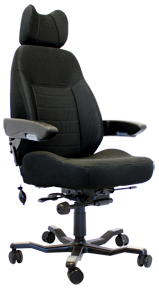 Ultra Seat Corporation is a leading manufacturer of OEM quality heavy equipment seats. Your next alternative to OEM and after market seating. Ultra Seat Corporation has been specializing in the development and manufacturing of innovative industrial seating for more than 20 years. We specialize in industrial / off highway / heavy equipment seating for material handling, forestry, construction, mining, 24 hour office chairs, marine, agriculture and turf. We offer industrial, OEM quality seating for a large range of applications and industries – from agriculture-tractors to wheel dozers, we have a high quality and reliable seating system ready. Our line of office chairs are designed for continuous, 24/7 intensive use. One chair does not fit all - speak to one of our seating specialists today and find the best ergonomic, 24-Hour Office Chair for you!